Performing on the Junior Theatre Mainstage is no small task! Rehearsal periods typically last 6 - 7 weeks. Most actors rehearse 1 or 2 times per week. But if you are lead, look out! You might just find yourself at our theatre 4 or 5 days a week. 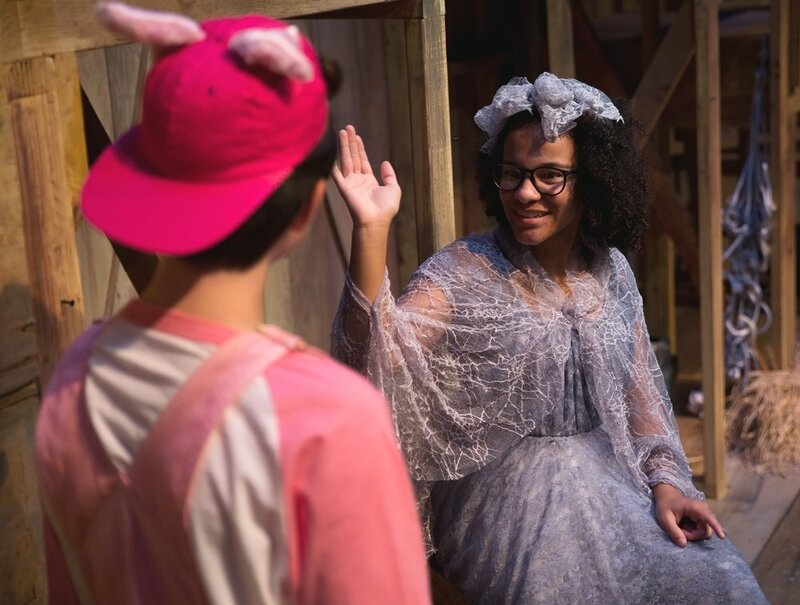 Alana is our actor playing Charlotte in our upcoming October 2018 production Charlotte’s Web. We interviewed her recently to share about her journey here at DJT and in the show. 1. What is the most challenging thing about being on the mainstage? Really pushing yourself to actually be the character. To bring them to life and make them feel real, especially when your character is not similar to you! 2. What is your favorite thing about being on the mainstage? The memories and new friends you make. Junior theatre is such an open and welcoming place so it's hard to feel like you don't fit in when so many friendly people are surrounding you! Alana reviewing her lines and blocking on a break at rehearsal. Lots to remember!! 3. What is something you have learned during the process of Charlotte’s Web? Sometimes you have to really push yourself out of your comfort zone. We all like to hide in our comfort zone but so many amazing things can happen when you push yourself a little more. 4. Why is Charlotte’s Web a special story? Charlotte's Web is especially important to me because I grew up watching the movies and I have always loved it and would act like Charlotte. You can really take a lot of meaningful things away from the show. For instance helping the ones you love, and it's not always a good thing to want everything to be centered around you. I feel like Charlotte really helps the other characters realize that. She goes out of her way to help save Wilbur's (the pig) life and when asking for help from the other animals she even convinces Templeton (the rat) to help her out. 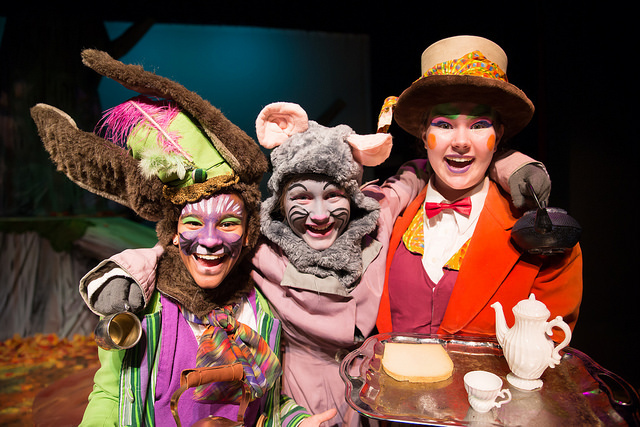 Alana as the March Hare (left), with her pals the Mad Hatter & the Dormouse in our 2017 production of Alice in Wonderland. 5. If you could give one piece of advice to younger students, what would it be? Just go for it!! If there's a show you want to audition for but you're a little nervous, do the audition. Also, it's ok if you don't get the part you want. I know it's sad when your really want a role but maybe get a smaller or different part, but trust me, the directors know what they are doing, and being that small role will help you improve your acting skills so you can maybe get a lead role you want in the future. It takes time but just keep a positive attitude! To be an actress on TV. I really wanted to be famous and on TV when I was younger and after I came across acting I just knew it was something I wanted to do. Even if I don't end up in TV, as long as I'm doing something with acting I will be happy. Alana as Showtime Pal, out and about with theatre friends and puppets at Modern Woodmen Park. She sang “Take Me Out to the Ballgame” at the 7th inning stretch! 7. What do you love most about DJT? I really love how nice everyone is at DJT, from the kids to the teachers. I joined summer of my Sophomore year and I thought I wasn't really going to have anyone to talk to because I was new to the theatre and I was an older kid, but everyone was so nice and welcoming and I always felt like I fit in. Those fears vanished quickly. I also really love being Showtime Pal because everyone is nice to you! Being Showtime Pal really has some of the best rewards ever because even if you mess up the kids always give you high fives and tell you good job even though they were the ones who performed! And a lot of the kids look up to Showtime Pal so they get super excited to see you. It's honestly one of the best things you could ever do!